The Woodie King production “Looking for Leroy” housed at the Castillo Theater, located at 543 West 42nd Street (between 10th and 11th Avenues) written by Larry Muhammad and directed by Petronia Paley, is running until March 31st. “Looking for Leroy” is a two character play performed by Kim Sullivan (Amiri Baraka) and Tyler Fauntleroy who plays Leroy’s intern Taj. The play highlights the character of Baraka, born Everett Leroi Jones, later changed to Amiri Baraka who sometimes wrote under the pen name Imamu Amear Baraka. His names are as mercurial as was his personality. A career of nearly 50 years, Baraka put out a volume of work that ranged from White racism to Black liberation. His works covered topics such as music, literature and society much of which was reflected in his poetry “The Music, The Book of Monk, New Poetry and Reflection on Jazz and Blues. His work both praised and condemned. In the play, Baraka hires an unpaid young intern, himself an aspiring playwright, to help him transcribe his latest play “Most Dangerous Man in America” reflecting the life of W.E.B. Dubois. 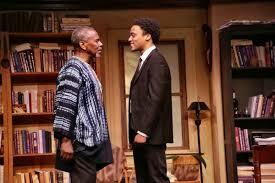 Baraka then takes his intern through a barrage of mood and wardrobe changes (Costume Designer Kathy Roberson), wherein the younger man and older man ofttimes engage in heated discussions wherein they vehemently argue their varied points of view on philosophy, varied intellectuals, social issues and the Black Man’s position in America. The set design done by Chris Cumerbatch is stationary depicting an office setting of a writer, filled with books and art that reflects a thinking man. The play reveals a very studied man, pompous and self-righteous, selfish and self-centered as well. Very critical of many of his play writing peers, wherein he criticizes the works of Ed Bullins, Douglas Turner Ward and even actors Sidney Poitier and Harry Belefonte. His positions often times hypocritical wherein they change as he evolves. Beatnick, then cultural revolutionist. Criticizing whites yet marrying one. His second wife Sylvia Robinson later adopted the name Amini Baraka. The man was complicated to say the least. According to Amiri as long as black writers sought to join the middle class, they would never be able to speak their minds which would lead to failure. The play turns its viewers into students as it covers a wide volume of Amiri Baraka’s learning, views and take on social issues. In the play, Mr. Baraka seeks to school his intern Taj, while in turn learning some things about himself from his honest and forthright intern. Neither man holds their punches as they study and inform one another in a war of minds that leads to enlightenment. The play runs until March 31st so if you haven’t seen it, I recommend that you do so before it ends.